As the new year approaches, it’s a good time to conduct a year-end review of your finances. If you’re already using Quicken or Mint to keep tabs on your dollars and cents, there’s a new app that’s hoping to replace them. CountAbout is the only financial app around that can import data from Quicken and Mint. The app was developed by long-time Quicken user Joseph Carpenter who wanted a better way to manage his financial information on the go. I spent some time exploring CountAbout’s features to see what sets it apart from the competition. If you’ve been using Quicken or Mint for a while but you’re looking for a new financial software to help manage your money, keep reading to learn more about how CountAbout works. Before you can begin using CountAbout, you first have to sign up for an account. To do that, you visit the CountAbout website and click the signup button. To create an account, just enter your email and a unique password and verify your registration. Just as an FYI, CountAbout works with more than 12,500 financial institutions. Besides your checking and savings accounts, you can link your investment accounts, credit cards, or loans. CountAbout can pull your transaction history from the previous 100 days – but you can choose the date you want to start with as long as it’s in that time frame. If you’re not using Quicken or Mint, you can skip this step. If you are, however, there are a few things to know to get your data imported. First things first, CountAbout recommends doing the import before linking your bank account so you don’t end up with any duplicate accounts or categories. Second, CountAbout doesn’t support the import of investment transactions, such as security purchases or stock quotes. To share your data from Mint, you’ll need to click on the Mint Import button on the “My Account” screen. This sends an email to your inbox with a link that takes you to Mint. From there, you’ll create an export file of your Mint data. Then, you can upload it to CountAbout. A few important things to note about importing from Mint. Transaction line items in Mint will be imported as individual, stand-alone transactions. Also, CountAbout reminds users that Mint is only a transaction-based website. In other words, your balances in Mint reflect what’s reported by your bank or credit card company. CountAbout tallies your balances based on your beginning balance and transactions. Once you import your Mint data, you’ll need to set the correct beginning balance. Otherwise, you won’t have an accurate picture of how much money you have. Pulling your data from Quicken is a similar process. 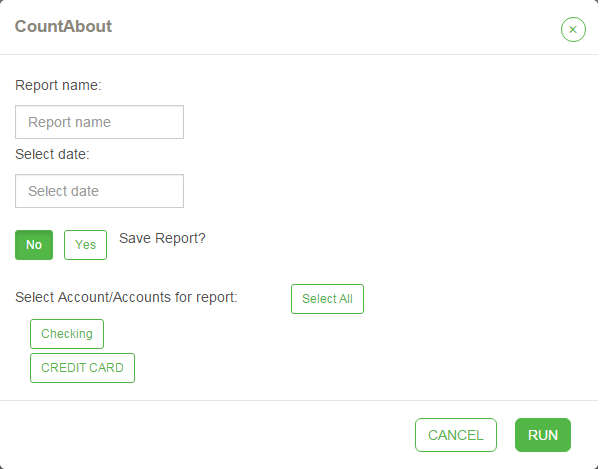 You’ll go to the “My Account” page in CountAbout and click the Quicken Import button. You’ll get an email with the link to Quicken’s instruction page detailing how to export data. Here, you’ll need to click the section titled “Export financial data to a QIF file.” Select all your accounts to create the file. Then, head back to CountAbout to finish importing it. Getting all of your financial information imported can be time-intensive. But once you’ve done that, you can begin exploring CountAbout’s features. Quicken and Mint both allow you to set up individual categories and CountAbout does the same. The category options are fairly detailed and they’re also customizable, which is good if you like to get really specific about tracking your income, expenses, assets, and liabilities. Within each of those categories, there are subcategories for breaking down individual expenses. There’s also category titled “Uncategorized”, where you can add things like ATM withdrawals, cash purchases, and expenses that just don’t fit anywhere else. A budget is an essential planning tool if you want to grow your money. CountAbout lets you create a budget for the year, which is great if one of your New Year’s resolutions is to keep a tighter rein on spending. After you create a budget, you’ll need to plug in some numbers. This is where all those categories come in handy. You’ll be able to see month-by-month how much money you’ve received, how much you’ve spent, and what the net total is. You can also estimate what you’ll spend for the year, based on your previous transaction history. That’s helpful if you want to get an at-a-glance projection of what your budget is going to look like over the next 12 months. The first three are pretty self-explanatory. You can run a report to see what you’re spending in a particular category, how much money is going and out of a specific account, or what you’re spending the most on based on the tags you assign. The compound report combines all three. You can choose a specific date range to run the report and choose which accounts, categories, and tags you want to include. Even better, you can then compare the results of the report against your current budget to see how you’re doing. If you want to keep track of recurring transactions, you can add those in CountAbout. You can choose from recurring withdrawals, deposits, transfers, or split transactions. For example, if you automatically send part of your paycheck to a savings account, you can record that. CountAbout allows you to add details for each transaction. That includes things like the date, the frequency, a description, category, tags, and the accounts the transactions occur in. That kind of detail is something a true numbers lover might appreciate. How Much Does CountAbout Cost? You can get started with CountAbout for free using a 15-day trial. After that, you’ll have to upgrade to a subscription service to keep using it. The basic plan is $9.99 per year. At this level, you’ll have full access to all of CountAbout’s functions except for automatic downloading of banking, credit card, or other financial transactions. However, you can enter transactions manually. You can also import files manually from banks that can generate QIF files. If manual’s not your thing, you can upgrade to the premium service for $39.99 per year. This will enable you to automatically download your banking, credit card, and other financial transactions. Compared to Mint, you’re obviously paying more since Mint is free. Quicken 2017, by comparison, is currently priced at $29.99 to $99.99, based on whether you choose the Basic, Deluxe, or Premier version. The best way to look at it is in terms of how often you plan to use the software. If you’re a stickler about tracking your finances and want the ability to keep your Mint or Quicken data, CountAbout delivers that functionality for a reasonable price. Are There Any Downsides to Replacing Quicken or Mint With CountAbout? CountAbout isn’t necessarily designed for someone who’s getting a grip on their finances for the first time. Something like Mint, for example, may better serve someone who’s just learning the ropes of budgeting. Another thing to consider is the fact that CountAbout is similar but not the same as Mint and Quicken. For some users, there may be a bit of a learning curve when getting started, especially if you’ve been using Mint or Quicken for some time. While CountAbout can help you paint a thorough picture of your finances, it doesn’t over-complicate things. Another nice positive is the fact that you won’t be bombarded with ads when you log in. Mint, for example, uses targeted ads to help keep the platform free. All in all, CountAbout could be a good choice for Quicken and Mint users who want to start fresh with their finances without losing their past transaction history.